Capella, also known as Alpha Aurigae or the Goat Star, is the brightest star in Auriga and the sixth brightest star in the sky. The only stars in the northern celestial hemisphere brighter than Capella are Arcturus in Boötes constellation and Vega in Lyra. The only other star visible from northern latitudes that is brighter than Capella is Sirius in the southern constellation Canis Major. Even though it appears as a single star when observed without binoculars, Alpha Aurigae is really a star system consisting of four components, or two binary pairs of stars. The Capella system is located relatively close to Earth, at a distance of 42.2 light years or 12.9 parsecs. The stars in the system have a combined apparent magnitude of 0.08. 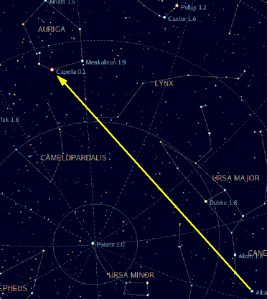 Capella can’t be seen south of latitude 44°S, but it is circumpolar north of 44°N; it never sets below the horizon. In mid-northern latitudes, the best time of year to observe Capella is in the winter evenings, when the star is almost directly overhead. In the northern hemisphere, Capella can be seen throughout the year at some time of the night. 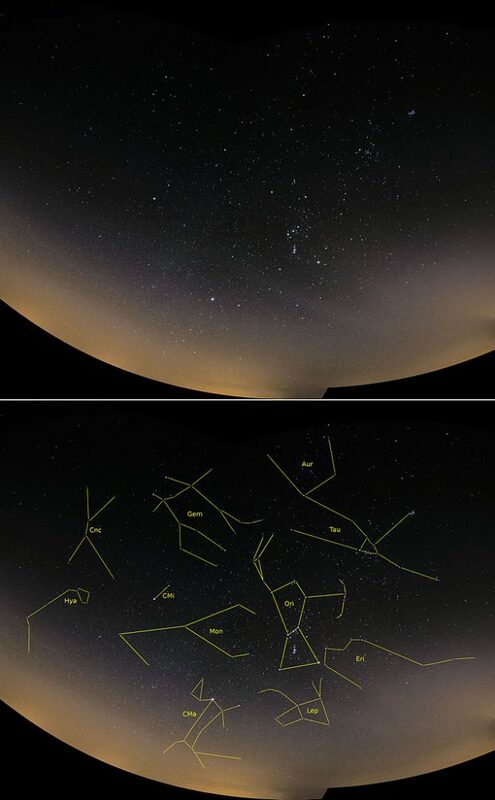 The star can be located using the Big Dipper. A line through the stars Megrez and Dubhe more or less points in the direction of Capella, going in the direction opposite of the Dipper’s handle. Capella marks the left shoulder of Auriga, the celestial charioteer, or the goat that the charioteer is carrying on his shoulder. In Greek mythology, the star represents Amalthea, the Cretan goat that suckled Zeus when he was very young. When Zeus accidentally broke Amalthea’s horn, it was turned into the Cornucopia, the horn of plenty, which would be filled with anything its owner wished for. In Johann Bayer’s Uranometria (1603), Capella marks the charioteer’s back. Diagram showing how to locate the star Capella by following the line made by the two stars at the end of the Big Dipper’s handle. Drawn by Jim Thomas on 19 June, 2006 by capturing a Kstars screen and adding the line with OpenOffice’s Draw. In a different version of the Greek myth, the Goat Star was associated with the nymph that owned Amalthea. It was said that the goat’s hideous appearance helped Zeus defeat the Titans. He skinned the goat and wore it as his aegis. Alpha Aurigae forms an asterism with Almaaz (Epsilon Aurigae), Haedus I (Zeta Aurigae), and Haedus II (Eta Aurigae). Zeta and Eta Aurigae are known as the Haedi, or the Kids. The asterism with the three goats was a separate constellation until Ptolemy merged it with the Charioteer in his Almagest in the 2nd century. The Kids can be found just to the south of Capella. There are no known planets or substellar companions in the Capella A system. Any Earth-like planets would have been burnt to cinder during the stars’ main sequence stage. Capella consists of two binary systems. The main pair is composed of two bright, large giant stars belonging to the spectral class G. The stars are in close orbit. Both components are currently expanding and will eventually evolve into red giants. The stars are designated Capella Aa and Capella Ab. Both are about 2.5 times more massive than the Sun. Capella Aa has a radius 12.2 times that of the Sun and Capella Ab, 9.2 times. The primary star is about 78.5 times more luminous than the Sun and the companion has 77.6 solar luminosities. The primary star is brighter when observed at all wavelengths, but with an apparent magnitude of 0.91, it is fainter in visible light than the secondary component, which has a visual magnitude of 0.76. The stars orbit each other at a distance of about 0.72 astronomical units or 68 million miles every 104 days. Their estimated age is about 400 million years. Even though this is only a tenth of the Sun’s age, the stars in the Capella system are nearing the end of their life cycle because they are significantly more massive than the Sun and they burn their supply of fuel more quickly. Capella is an example of an RS Canum Venaticorum variable, a close binary star with components that have active chromospheres which cause large starspots and variations in magnitude. The system is a non-eclipsing binary star, with neither component passing in front of the other and blocking its light when observed from Earth. The other binary pair in the Alpha Aurigae system lies about 10,000 astronomical units from Capella A. The pair consists of two dim, small red dwarfs, usually designated either Capella H and Capella L, Capella Ha and Capella Hb, or Capella C and Capella D. The pair’s combined visual luminosity is only about one percent that of the Sun. The stars have an average separation of 48.1 astronomical units and orbit each other with a period of around 388 years. 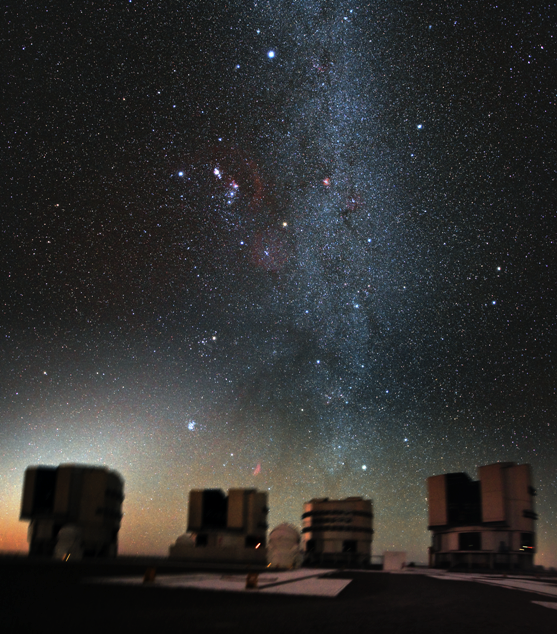 There are other stars in the same line of sight, but they are not physically related to these systems. They are visual companions, and only appear to be close to Capella when observed from Earth. Capella is the brightest star in the sky that is the same spectral class and colour as the Sun. It is the brightest yellow star in the sky. 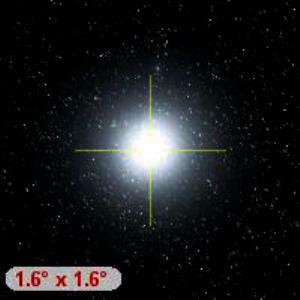 Capella is much larger and more luminous than the Sun, and also much more distant, at 42.2 light years, compared to the Sun’s 8 light-minutes. Capella is travelling through the Milky Way at a speed of 39.7 km/s relative to the Sun. The star’s projected galactic orbit takes it between 21,900 and 27,100 light years from the Milky Way’s centre. 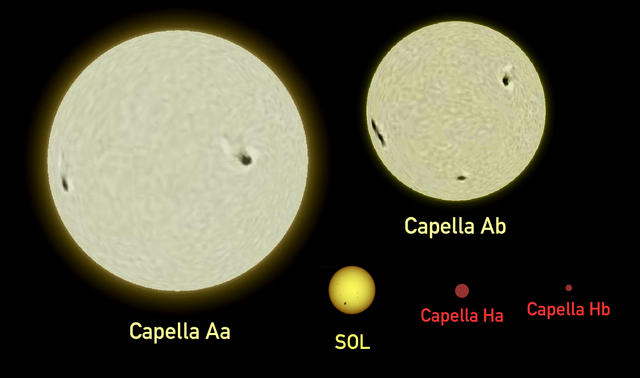 Capella made its closest approach to the Sun about 237,000 years ago, when it came within 29 light years of the solar system and brightened to magnitude -0.76. Capella’s binary nature was first discovered by professor William Wallace Campbell of the Lick Observatory in 1899 after analyzing photographic plates taken in the period from August 1896 to February 1897. In 1919, John Anderson and Francis Pease were the first to resolve the Capella star system interferometrically at Mount Wilson Observatory. In 1920, they published an orbit based on their observations of the system. Capella was the first object outside the solar system to be measured this way. A high-precision orbit was determined in 1994 based on the data provided by the Mark III Stellar Interferometer, also at Mount Wilson Observatory. On April 5, 1974, X-rays were detected from Capella. The X-rays are believed to be mainly from the corona of the more massive star in the system. Interactions of the magnetic fields between the stars Capella Aa and Ab are believed to energize the corona of star Aa and create an X-ray luminosity about 10,000 times that of the Sun’s corona. In September 1995, Capella became the first object to be imaged by a separate element optical interferometer. The star system was imaged by the Cambridge Optical Aperture Synthesis Telescope. In 1914, Finnish astronomer Ragnar Furuhjelm noted that the spectroscopic binary had a dim companion which was likely physically bound to it as it had similar proper motion. The binary nature of the companion was discovered by Carl L. Stearns in 1936 and later confirmed by G. P. Kuiper. 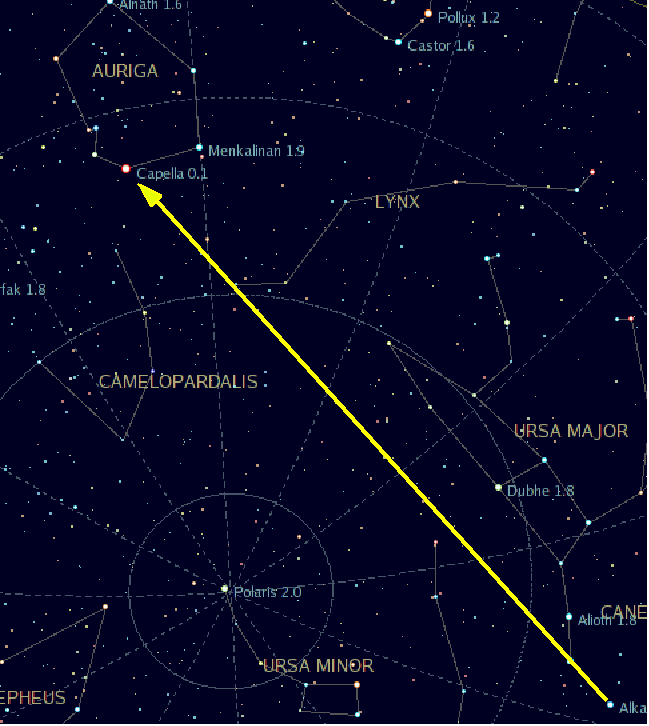 Capella is the closest first magnitude star to the north celestial pole. It lies on the opposite side of the pole from Vega, which is located at roughly the same distance from the pole. A line drawn from Capella to Vega almost passes through the North Star, Polaris. Alpha Aurigae was the brightest star in the sky from 210,000 years ago to 160,000 years ago. It had a visual magnitude of -1.8. Before Capella, Aldebaran, the brightest star in Taurus, was the brightest star. The two were relatively close to each other at the time. In 1960, the American astronomer Olin J. Eggen discovered that Capella was a member of the Hyades moving group, as it was travelling in the same direction as the stars in the Hyades cluster. The stars are of a similar age and share a common motion through space. Capella was seen as the Goat Star long before Ptolemy. Roman authors Pliny the Elder and Manilius both called the star Capra, Caper or Hircus in the 1st century AD. Manilius mentioned it in his Astronomica. In ancient Mesopotamia, there was a constellation called GAM, which represented a crook or scimitar. The constellation may have represented the star Capella alone or it may have consisted of a larger group of stars, similar to those forming the present day Auriga constellation. The crook represented a shepherd or goat-herd and was formed by the bright stars of the modern constellation, except for Elnath, which was assigned to both Auriga and Taurus constellation. Bedouin astronomers viewed the stars of Auriga as a herd of goats. The Bedouin of the Negev and Sinai called Capella al-‘Ayyūq ath-Thurayyā, meaning “Capella of the Pleiades,” because the star points the way to the famous star cluster. Medieval names for the star included Alhajoth and the variations Althaiot, Alhaior, Alhatod, Alhojet, Alhaiset, Alanat, Alioc, and Alanac. Most of these may have been derived from the star’s Arabic name, al-cayyūq. In Macedonian legend, the star represented Jastreb, or the Hawk, getting ready to pounce on Mother Hen, represented by the Pleiades cluster (M45), and the Rooster, represented by Elnath. The Chinese knew Capella as the Second of the Five Chariots, Woo Chay, as it was part of an asterism representing the Five Chariots. The other stars that formed the asterism were Beta, Theta, Kappa, and Gamma Aurigae, now known as Elnath, Beta Tauri, and assigned to Taurus constellation. Hindu astronomers knew the star as Brahma Hridaya, the heart of Brahma. The Booroung people of Victoria in Australia called the star Purra, meaning “kangaroo.” The celestial kangaroo was pursued and killed by the twins Yurree and Wanjel, represented by the bright stars Castor and Pollux in Gemini constellation. In Hawaii, Capella was known as Hoku-lei, or “star wreath,” and formed an asterism with Sirius in Canis Major, Procyon in Canis Minor, and Castor and Pollux in Gemini. Tahitians knew the star as Tahi-ari’i, the mother of prince Ta’urua, represented by the planet Venus, who sailed his canoe across the night sky. The first known mention of Capella is in a Akkadian inscription dating back to the 20th century BC. Capella is sometimes referred to as the Shepherd’s Star in English literature. Capella has often been mentioned in works of fiction, including the novels The Exiles of Capella (1949) by Edgard Armond, H. Beam Piper’s Lone Star Planet (1958), Robert A. Heinlein’s Starship Troopers (1959), Jack Vance’s Emphyrio (1969), James Gunn’s The Listeners (1972), Philip José Farmer’s Time’s Last Gift (1972), Christopher Evans’ Capella’s Golden Eyes (1980), and Anne McCaffrey’s The Rowan novels. The star was also mentioned in the Star Trek (TOS) episode “Friday’s Child,” Stan Lee and John Buscema’s Marvel comic books, and the games BattleTech, Frontier: Elite II, Escape Velocity, and FreeSpace 2.